TJ’s has elected to use the non-standard “barbeque” on this bottle. Getting pretty fancy there, Joe. Hot dang! Now this is some good BBQ sauce. Though I’m sorry to admit it, barbecue has never been my specialty, however, even I can recognize that Trader Joe’s Carolina Gold Barbeque Sauce is top shelf. If it were possible to reach back through time and space to tweak one aspect of my childhood, I would probably make it so I came from a proud tradition of barbecuing. There is something incredibly appealing to me about the great American BBQ – a potent blend of technical know-how, manliness and cherished family tradition that culminates in a perfect summer day. As it is, I grew up unaware of the heights barbecue can achieve, and of the four great traditions within it. I speak, of course, of the four chief BBQ regions in the US: Memphis, Kansas City, Texas and, of course, the Carolinas. Books can and have been written on the character of these distinct styles and their various merits. I have no desire to choose sides on that hotly contested subject, (about as much desire to weigh in on that as I do to choose sides in European Football League) so for the purposes of this post we’ll limit ourselves to the qualities of the sauce itself. TJ’s leaves it at Carolina on the bottle, but those in the know could place this sauce with far more accuracy. The golden color and strong mustard base place it firmly in central South Carolina, in Midlands region. The hankering pig eaters in those towns were the first to really place mustard based BBQ sauces on the map, and have been knocking them out the park ever since. That’s right – mustard. Carolina Gold still incorporates the tomato puree you find in more name brand sauces, but in a much smaller quantity than the rich yellow mustard and vinegar which are the hall-marks of Carolina sauces. Thanks to this mustard and vinegar base, this sauce tastes like the half-way point between more traditional BBQ sauces and Honey Mustard. The first thing you’ll taste when you take a bite of that pork rib is the zing and tang of a sharp mustard followed by the even sharper vinegar. That’s just first blush, however. The complex medley of tastes you expect from a good barbecue sauce follow right on the tail of that, softening the edge. Unlike some Carolina sauces, Trader Joe’s Carolina Gold is thick, not watery. This might offend some purists, but makes it great for slathering on pork and beef. In fact, the mustard edge of the sauce allows it to pair with far more foods than another barbecue sauce normally could – try using it on your sandwich or veggies. There is, however, a dark side. This sauce doesn’t taste very sweet outright, like a Kansas City sauce might, but still packs in plenty of sugar. One serving (two tablespoons) contains a whopping 14 grams of sugar. 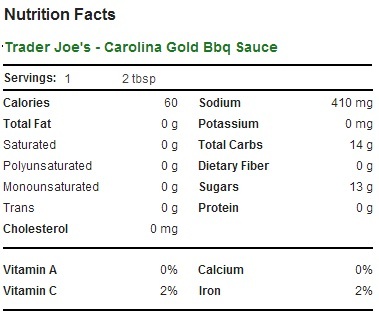 For comparison, Bull’s Eye’s name brand Carolina sauce only weighs in at 11 grams of sugar for the same serving size. For what it’s worth, this sugar isn’t high fructose corn syrup, like it is in so many other name brand barbecue sauces, but made from cane sugar. How much that means to you is a matter of personal taste, for my part I find that processed sugar tends to be processed sugar. Even with the high sugar content, this sauce still comes out in the black in my books – hands down the best store bought barbeque sauce I’ve ever had. Would I Recommend It: There are probably better small batch BBQ sauces out there, but if you haven’t found them yet go for this one. Would I Buy It Again: I plan on restocking for next BBQ season. Final Synopsis: A delicious, mustard-based barbecue sauce that goes well with everything.